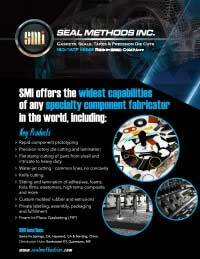 We are the world’s most comprehensive specialty components fabricator, and a global leader in die cut solutions. Our diversified technologies have allowed us to stay on the cutting edge of gasket & seal manufacturing. From noise and vibration barriers to cushions and custom die cuts, Seal Methods has the material knowledge and fabrication skill to create custom components for even the most demanding applications. As one of the first gasket manufacturers to achieve ISO/IATF 16949 certification, we maintain a leadership position as a global supplier. Our manufactured products can be found in hundreds of applications and thousands of products. Through long-term partnerships with leading raw material manufacturers, we have access to the most advanced materials at very competitive prices. SMI’s cutting-edge equipment allows us to produce short and long run quantities according to our customers’ needs. From prototyping on tool-less cutters to manufacturing higher production quantities cost effectively, our facilities can meet any request, no matter how specialized. We produce gaskets & seals for a wide variety of different markets, including OEM Automotive, Aftermarket Automotive, Construction, Electronics, Energy & Electric Vehicles, Heavy Truck & OEM Transportation, Industrial, and Medical. Gaskets and seals are an integral component of any device that holds gas or liquid. They compensate for irregularities – large or small – between mating surfaces, which would otherwise compromise a unit’s ability to prevent spills and leaks. They also perform important temperature barrier functions. While gaskets are normally cut from sheets or rolls, seals are formed individually in their own configuration. The design of flat-cut gaskets begins with the specific application it will perform, in order to identify the most appropriate material for the job. We have a range of fabrication techniques available, from extrusion and molding to die cutting. Our sales engineers guide you through the selection of an almost limitless number of choices to find the one most appropriate – both performance-wise and price-wise – for your application. SMI in-house capabilities mean our experts can specify, design, and manufacture everything on site, so our clients get the right material for their seal and gasket functionality, as well as cost savings and exceptional quality control. With decades of experience, 350,000 square feet of capacity, and quality certifications you can rely on, Seal Methods is an industry leader in custom seals and gaskets. All of our locations use state-of-the-art equipment, including the option of tool-less CNC cutting (knife cutting, laser jet cutting, and waterjet cutting), fabrication, or high speed die-cutting to provide high quality, precision custom gaskets and seals in the timeframe you require. Request a quote here, or call 800-423-4777 to learn more.